Explore the Digital World with Tai, Matt, Sora, Izzy, Mimi, Joe, T.K. and their Digimon in the first 21 episodes of Digimon Adventure: Season 1. 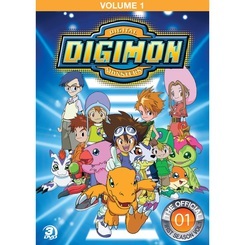 This 3-DVD set includes the first two natural story arcs of the classic Digimon Adventure series. In the first arc, seven kids are transported to a strange digital world where they make friends with Digimon, creatures born to defend their world from various evil forces including Devimon and his Black Gears. The Digidestined and their Digimon eventually defeat Devimon, but they soon learn there are other bigger threats after them. To stay safe, they must band together and keep moving through the Digital World. In the second arc, the kids travel to continent Server and learn they have the ability to help their Digimon digivolve with the power of Crests, which are guarded by Etemon and his Dark Network. Tai and MetalGreymon are able to destroy Etemon and collect all the Crests, but will it be too late? Digimon have begun crossing a dimensional gate from the Digital World to enter Earth.